As the No campaign never tire of telling us, only three countries use AV at the moment. One of them is Australia. According to one poll commissioned by the Institute for Public Affairs, 57% of Australians wish to go back to FPTP rather than AV. The IPA describes itself as “Australia’s leading free market think tank. Promoting public policy based on individual liberty, limited government [and] free markets”. Call me cynical, but they don’t sound like the sort of body that is generally in favour of fluffy causes like a fairer voting system. Antony Green is a political commentator in Australia who has been following the AV Referendum, and has become increasingly bemused by No2AV’s arguments. In this blog he goes into the opinions of Australians of the various voting systems in more detail. He actually finds that most Australians would actually prefer Optional Preference Voting – ie the version of AV that would be adopted in the UK – to either Compulsory Preference Voting or First Past the Post. It also gives a greater weight to first preference votes, decreasing the tendency of perverse outcomes such as where the candidate who comes third determines who wins in a three cornered contests. It led to a significant drop in the number of people voting in Australia – that’s why they had to make voting compulsory. AV doesn’t help democracy, it stands in its way. As was pointed out on Labour List, there’s no evidence for this – indeed, turnout was 71% in the first election held under AV and only declined in the next election. William Hague has said that “A vote for AV would be a vote for the BNP”. Except the BNP would not benefit under AV. Indeed, apart from the Conservatives they are the only major party not to be in favour of a Yes vote. They say that it is “unfair to smaller parties”, whilst ignoring the fact that smaller parties such as UKIP and the Greens are in favour of AV. The fact is that AV would benefit these smaller parties as it would mean they pick up more first and second preference votes. The BNP, in contrast, would pick up very few second and third preferences. I’ve written in far greater detail about whether the BNP would benefit in this post. David Cameron has called AV “complicated”. It isn’t. Maybe Cameron has problems counting to five, but I’m pretty sure all British voters can. As this flowchart demonstrates (taken from here) First Past the Post can, on occasion, be more complicated than AV! Martin Kettle quotes an unnamed Conservative minister as saying that “The public have many priorities. This [electoral reform] just isn’t one of them”. Apparently we shouldn’t care about electoral reform because it isn’t brought up as an issue on the doorstep by voters. I daresay it isn’t a doorstep issue, but it’s still important. Poverty in Africa, for instance, or climate change, are important issues but aren’t brought up on the doorstep either. Also, electoral reform should be important, as it can help address issues arising from people’s disconnect from politics and politicians. In any case, this argument is a smokescreen from the No camp designed to get around the fact that AV is simply a better system than FPTP. See number 2 of this from Conservative Home: “supporters of fringe parties can see their vote counted five or six times”. This is ridiculous. Everyone’s vote gets equal weight, and gets counted in every round, but some votes will be transferred to a different party. But the no campaign’s claim that AV gives some voters two votes, also made by former foreign secretaries led by Douglas Hurd, is equally absurd. As Jo Swinson, Liberal Democrat MP for East Dunbartonshire, said on last week’s Question Time, if I ask you to buy me a Mars but a Mars is not available and I suggest you buy a Twix instead, I will not receive two bars of chocolate. A transferred vote is not a multiple vote. One final point on this is the letter a group of historians wrote urging people to vote No. It’s a rather silly letter written by some people who have gone down in my estimations. Richard Evans, I thought you’d know better. Thankfully this pile of rubbish was nicely flattened by Hopi Sen. They claim that “For the first time since 1928 and the granting of universal suffrage, we face the possibility that one person’s casting ballot will be given greater weight than another”. This is simply not true. Until the end of the 1945-50 parliament, several seats in the House of Commons were reserved for the English Universities. Any graduate from these universities could vote in the election for these seats, in addition to their vote in the residential constituency. So the vote of University Graduates counted for more than that of non-graduates. Further, from 1918 the elections for those seats were conducted by Single Transferable Vote. So Britain had both an unequal franchise, and a system of proportional representation in the House of Commons well after the introduction of universal suffrage. The rest of the blog post is well worth reading. Finally, just to put the issue to bed, or if you need more convincing, here’s Antony Green once more. Fiji is one of those countries that has the AV system at the moment. The No2AV myths-busting blog says that they “want to scrap it”. Except that’s because they had a military coup in 2006, at which point their new government banned elections and made plans to rewrite the constitution. That’s why Fiji are thinking of scrapping AV. Voters are only expected to vote for a single party and then allow their chosen candidate to decide where their vote is sent if he/she is eliminated. So it’s not even the same system that’s being proposed in Britain – it’s a much worse system. This was John Prescott’s line on Newsnight last week. It’s completely spurious, as it’s based on the fact that AV will lead to more hung parliaments (see “H”). Indeed, it gives voters more power, as AV ends tactical voting (see “I”). Also, MPs will have to work harder for their constituents and reach out beyond their core vote to win seats. David Cameron said in his No2AV speech that AV would mean hung parliaments would become “more commonplace”, with all the horsetrading which that implies. Leaving aside whether coalitions are a good or bad thing, AV won’t lead to more hung parliaments necessarily. There have been fewer hung parliaments in Australia, which uses AV, then in Britain, which uses FPTP. There’s simply no evidence to support Cameron’s claim. In other words, our current system is broken. AV would be a small but significant step towards fixing that system. Tactical voting involves constituents who agree with the policies of one party deliberately choosing not to vote for their candidate. Usually, this is because the candidate in question has little prospect of winning and so the voters prefer to give their second-choice options a better chance of winning the seat. 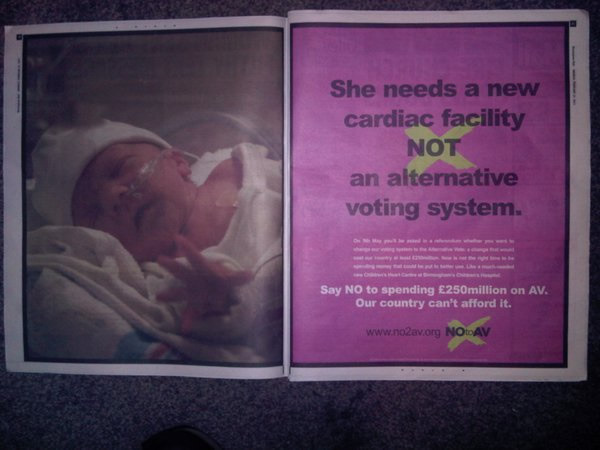 This type of tactical voting – essentially “do I vote with my head or my heart?” – is completely removed with AV. Say you are a Green voter in a Labour/Tory marginal. You might vote Labour, rather than Green, to ‘keep the Tories out’, because you see Labour as the “least-worst” option. Under AV you could vote Green as your first preference and still influence the outcome of the election with your second preference. For example, in a three way seat where both Labour and the Liberal Democrats were in danger of coming last, a Conservative might be tempted to give their first preference to Labour, for fear a Labour elimination would mean a hefty vote transfer to the Lib Dems. This is such a ridiculous hypothetical scenario it doesn’t even bear thinking about. He cited the danger of tactical voting wiping out a party, the “unpredictable’ disproportional link between seats and percent of the vote ‘it is even less proportional that FPTP [first past the post]”. Under our system, AV would have a number of positive features which persuade a majority of us that it would be superior to FPTP as a method of choosing constituency representatives. First, there will be many fewer ‘wasted votes’ in the constituency side of the election, and far more voters will potentially influence the result. This, we hope, will encourage turn-out and participation. Second, it would encourage serious candidates to pitch their appeal to a majority of their constituents, rather than just seeking to target a hard-core minority of the party faithful. This should lead to more inclusive politics than FPTP. Third, because second and subsequent preferences may count, it will discourage individual candidates from intemperate attacks on their rivals, since they will be hoping to gain their second votes and will not wish to alienate their supporters. This should contribute to the more consensual and less confrontational politics to which the majority of the public appear to aspire. There’s nothing more powerful than that – when people see their vote had led to the removal vans driving down Downing Street. Except, as David Aaronovitch pointed out in the Times last Thursday (I came across the article in a copy of the paper in a Chinese takeaway, you can find it through the paywall if you really want to) AV would actually make it easier to remove unpopular governments. Voters would just rearrange their preferences so as not to vote for them. Jenkins calls this tactical voting – I’m not sure I agree with that. Can you call not voting for a party you don’t like tactical? AV represented “a threat to democracy” since it is a constitutional change that will benefit one party, the Liberal Democrats. There’s no reason why AV would automatically benefit the Lib Dems. It would only if people voted for them, and judging from recent polling data, that doesn’t look like it’ll be the case. Also, if it’s only the Lib Dems that benefit from AV, why are all the political parties apart from The Tories and the BNP in favour of it? As I said in “B”, parties such as the Greens and UKIP would get a lot of first and second preferences. The simple fact is that voters are moving away from Labour and the Conservatives to other parties, as I argue here. The introduction of AV would be an acknowledgement of that change. I’ve written more about the Lib Dems in No2AV plays the Nick Clegg card. AV is a baby step in the right direction – only because nothing can be worse than the status quo. So it’s an improvement on the present system. See number 6 of this Con Home article mentioned above. However, to quote John Rentoul, “I want it”. So do a whole plethora of political parties and campaigning organisations, the Church of England, Colin Firth, Helena Bonham Carter, John Cleese and Eddie Izzard. See point 1 of that Con Home article cited above. Except AV is used by the Labour Party and Liberal Democrats to elect their leaders, by trade unions to elect their representatives, by student union bodies, by MPs to appoint select committee chairs, the Church of England to elect Bishops, etc etc. It’s commonly used in Britain already (about 14 million people use it in Britain already). Close cousins of AV, such as the Supplementary Vote system, are used to elect elected Mayors, such as in London. AV is even used to decide Best Film at the Oscars. I’ve said it before and I’ll say it again -FPTP is totally unsuited to modern-day politics. They originally had AV under Australian rule and it worked quite well for the tribal society, electing candidates who could appeal to and work with a broad selection of the population. Upon gaining independence they decided to choose the simpler system FPTP, however it lead to so many problems; divisiveness, corruption, negative and dirty electoral campaigning, and candidates winning constituencies with as little as 5% of the vote; they decided to return back to AV. You don’t know because people vote differently under different electoral systems. Also, the whole campaign would have been different, with candidates also campaigning for the second preference votes of voters for other parties, rather than merely relying on their core voters. Under AV, the whole dynamic would have changed. Thus, you would see more votes for smaller parties (such as the Greens, the Pirates and, maybe, the Monster Raving Looney Party) because people could vote for a smaller party with their first preference whilst still being able to influence the outcome of the vote with their second. You would also have seen an increase in Tory first-preference voting, instead of some voting Lib Dem tactically. That’s because AV virtually ends tactical voting. The No campaign haven’t given us any. Probably because the advantages of FPTP, such as the constituency link, are retained by AV, whilst AV is also an improvement on the current system. My fears that Labour would end up getting trapped into a mindset of “what’s bad for the coalition is good for us” have proven to be well founded, and it is an infection which has spread across the board, even among some relatively sensible types. A perfect example is AV. Leaving aside the rather tedious row about boundary changes (which, aside from some of the legitimate social justice issues at stake, amounts to two parties with a rather inflated sense of entitlement arguing about which party should be given the greatest unfair advantage), the idea that losing the AV referendum will damage the coalition is quite mistaken. It will certainly damage the Liberal Democrats, but we’ll have nowhere to go. Our only recourse will be batten down the hatches, refocus on Lords reform and a handful of other reforms, and hope for the best. It will be the Tory right that will hold all the cards, not Labour. The idea that suddenly we’ll decide to pull out of the coalition and meet our doom in an early general election is pure fantasy. By contrast, what better way to undermine the Clegg-Cameron love in than for Labour to champion AV, and win? The Tory right will be damaged, Labour will come out smelling of roses and the Lib Dems’ influence within the coalition will increase. For many Tories, that will be simply unscionable. An unruly Tory backbench will make Lib-Lab cooperation in Parliament far easier. This is the prize Labour have within their grasp; yet they are so obsessed with ‘betrayal’ they simply can’t see it. I can only look on in despair. Apologies for the lengthy quoting, but it really cannot be put any better than that. We’ve waited for generations for a chance to destroy the Liberal Democrats and get British politics back to its natural balance of a two party democracy. How much can you get wrong in just a single sentence? For a start, this isn’t all about the Liberal bloody Democrats! Also, the two party system has gone. It’s dead. It’s an ex-system. Why should a two-party system be “natural” for Britain? Over one-third of voters voted for a party other than Labour or Conservative, when that figure was 5% fifty years ago. British politics is more pluralist now. Deal with it. AV would make no difference in nearly 300 safe seats where the sitting MP has 50% of the vote, or is close to it. Which of course means that it would make a difference in half of seats. Which means it’s an improvement on the present system. Nobody is suggesting that AV is the cure for all our ills, but it is an improvement on the present system. …turns out to be the majority shareholder in Britain’s leading and highly profitable supplier of election services, and its dividends are funding the campaign. The business, which is called Electoral Reform Services Ltd, turns over £21m. ERSL (too many acronyms in this piece, aren’t there?) is the supplies ballot papers and vote counting machines, etc. The Spectator, and other areas of the right-wing press, are trying to spin this non-story into one saying that the Yes campaign is heavily financed by a large, corporate vested interest. Just last week they posted this, saying that, er, ballot papers and Yes2AV leaflets were being printed on the same machines. Because obviously the ballot papers will be somehow contaminated by the filthy prescence of Yes literature. This is a complete non-story. For a start, the ERS and the ERSL are two legally separate companies, so there’s no dodgy dealings afoot. Second, the Spectator try and imply that the ERSL will profit from providing vote-counting machines, but there are no plans to introduce vote counting machines because of AV! Also, and I cannot believe I have to point this out to journalists, but Electoral Reform Society supports electoral reform is not, cannot and won’t ever be a story. Once again we have slurs from the No camp to distract us from the fact that AV is simply a better system. I’ve written about this before too. Basically, the best way to get PR is to have a resounding “Yes” vote on a high turnout. How would a No vote further the cause for PR? That thought is ridiculous. It’s true that groups such as the Electoral Reform Society would prefer PR. But AV is the deal on the table, and it’s an improvement on the current system. If someone offers you half a loaf of bread, you’re going to take it, because it’s better than no bread at all. See my expanded argument on why people in favour of PR should vote Yes here. AV will cost £250m! Except £82m of that is apparently the cost of holding the referendum, which would be incurred even if there is a No vote. And £130m of that is on buying voter counting machines. They don’t use them in Australia, which uses AV, but DO use them in America, which uses FPTP. That’s a massive fail from No2AV then. It’s a disgusting and misleading ad, as Left Foot Forward rightly points out. There’s another good blog by Stephen Baxter at the New Statesman here. I’m bored of these stupid arguments from No2AV. It’d be nice if once, just once, they would engage with the issues, and present the British public with a positive case to keep FPTP. Sadly, it seems we have another two months of negative campaigning. Such, such are the joys. If you’re bored of the No campaign’s rubbish, vote yes TODAY! (UPDATE April 27th, 2011: I’ve updated this article to include all the new rubbish since I wrote this almost seven weeks ago now. Thanks to all those who’ve provided material for this, including Daniel and waronfreedom in the comments, as well as Tom and Emilie for putting other information my way as well). This entry was posted in Politics and tagged AV, AV Referendum. Bookmark the permalink. Fantastic blog page! A joy to read. I agree with what you say and feel it’s such a pity and a waste that the ‘No’ camp have reduced themselves to funding a vacuous and sickening advertising campaign as opposed to allowing the voters a fully informed choice by outlining what they believe are the merits of FPTP. I fear that a victory for the ‘NO’ camp will only endorse FPTP as an appropriate electoral system when today’s society has so many different voices that need to be heard and represented. There is no way that the two main parties will ever introduce another opportunity to campaign for electoral reform so under FPTP we will be waiting forever! That is why I feel it is imperative that we don’t let this chance go to waste and that is why I am voting YES! Absolutely great blog, Cory. I’ve never seen that quote from James Graham, which puts the position of the coalition if their is a No Vote on 5th May, so well. We have weeks of this negative campaigning to go, our only hope is to try to remain positive and challenge the myths of No2AV, something you have managed here, excellently. I especially liked that quote from Jenkins. Very useful! Papua New Guinea is a very tribal society so the problems of FPTP amplified. In Western countries we suffer them on a smaller, less noticeable, but still significant scale. Fiji have a weird system. A candidate could promise you the world, and then transfer all your votes to the BNP! So there was controversy about the Fiji system even before the military takeover. However, as the Vice President pointed out, the controversy could be solved by letting voters choose where their votes are transfered – i.e. give them a proper AV system like ours. This post needs to be publicised far and wide, because it’s the best and most concise vade mecum on the subject of why FPTP is a borked system that deserves to be binned ASAP. When the No2AV gang resort to Rovian strategy, as clearly they are judging at the “baby” advert in the Birmingham Mail yesterday, we *need* something like this in order to win over the many “don’t knows” and “don’t cares”. Great blog by the way Cory. Onto my blogroll you go. Thanks to everyone for their very kind comments. I’m hoping to turn this into the definitive list of No2AV rubbish, and a few people (both here and on Facebook) have provided stuff I can add to this – on Fiji, Australia, Papua New Guinea etc etc. So I will probably update this post with that over the weekend. Once again, thanks all, and let’s spread the word. We can win this! Still loving your work here. Cameron and the rest of the Conservative Party (together with those Labour MPs who haven’t understood that the multi-millionaire Tory donors funding No2AV are not shelling out for the sake of democracy) have been quite happy to endorse what they know perfectly well to be nothing more than a farrago of irrelevant assertions, misrepresentations, half truths and downright lies. And these are the people who are running the country, our country. Blair and Mandelson for all their spin were pure as the driven snow compared with this lot. No! to AV will mean Yes! to government by liars. Under point T: The Labour bod there is also forgetting that it was the emergence of the Labour party that removed two-party politics. If two-party is Britain’s “natural” state, then that is a Lib/Con split and Labour should disband immediately. Please note: Q normally comes BEFORE R in the alphabet! Counting the votes would cost more, since in some constituencies some ballot papers would have to be counted more than once. Where a candidate has an overall majority in the initial tally there is no additional cost. In many cases the leading candidate in the initial tally would be pushed over the 50% mark after only a few papers had been recounted. In the “worst” case several counts would be needed. Denis Cooper, in a detailed post on Gowers’s Weblog*, gives the example of a by-election in Ireland where nine candidates stood and 28,412 people voted. The full eight counts were needed, giving a total of 16,878 additional sorting and counting operations, an increase of 59%. So, 60-odd percent more teller-hours at £16-odd per hour – in a small number of constituencies. Cooper puts the total extra cost of counting an AV election in the UK at around £2m (once every four years or so). As well as the additional wear-and-tear on our pencil lead. As an engineer I am always having to ask “Do you want it cheap, or do you want it good? Considering the overall budget, and the expenditure on duck houses, moat cleaning etc. £500k per year seems a reasonable price to pay. Counters are paid a set fee, not by the hour, but it’s likely there will be some cost. As Colin says, it’s worth it. It’s certainly not £250m – as you suggest it’s actually about 1% of that figure, which is a drop in the ocean. This was a pleasure to read! Brilliant article, clearly and concisely written and should be widely distributed! I will do my best to send it on a few Facebook journeys among my student peers!! Thank you very much Adam! Please spread the word as much as you can! Thanks Ben, they’re all very good. Will link to them when I update this next. What a load of rubbish….. the voting flowchart is complete nonsense! Well thanks for that. Errrr…arguments? Facts? I presume you’ll write another post debunking all the lies and half-truths of the Yes campaign. When the lies and deceptions are taken out from both campaigns – nothing’s left. If you want to write that, be my guest. But I’m certainly not going to. There’s not enough material. As far as I can see, our campaign has just been a little bit incompetent and sanctimonious, whereas the No campaign has just been completely and utterly evil. In my view, you should vote Yes on Thursday because all the arguments No have are rubbish. And this post outlines why. 5. there is no post! 5. there IS a post: the first candidate to pass 50% in any round of counting has won. ALL of these statements are incontrovertible. Thereafter all that is needed is a simple explanation of the mechanism to show how these benefits are achieved. Preferential voting systems are open to the objection of possible monotonicity (later preferences having the effect of counting against the first), but as far as I can see this is entirely theoretical and could not possibly have relevance to real-life elections – especially set against the absolute certainty that FPTP can let the least popular candidate win and lets many people’s votes go to waste. Can someone please explain “participation” to me. On wiki (this link here: http://en.wikipedia.org/wiki/Instant-runoff_voting) it seems to be stating that under AV it’s actually that by voting you can diminish your chances of your preferred candidate winning. This makes no sense to me whatsoever but no one’s been able to explain it me. Can you help?! A quick look at that seems to suggest that it depends on people’s 2nd/3rd preferences. The examples page on here: http://en.wikipedia.org/wiki/Participation_criterion does put it quite well. It does seem like a fantasy situation that probably won’t happen though, so I wouldn’t worry about it too much. Hope that’s cleared that up! No to AV are using it as an argument to NO on Thursday and I just don’t understand it enough to argue against it. Even with the link you put up it still makes no sense to me. The suggestion doesn’t affect who wins at all – as you say it affects 2nd and 3rd preferences…..
Am very befuddled by it and am worrying about it too much! Don’t try to answer – just hit back with the dreadful drawbacks of FPTP. I think you have an idea there Johnathan. My partner is voting no to AV on Thursday. When asked why he said it’s because it’s the best way of ensuring the Tories retain power, but accepts it isn’t fair or proportional. At least he’s honest about why he’s voting no so I don’t mind (so much). However, so many people are voting no and just can’t or won’t give a decent reason. The first argument I haven’t been able to counter is the participation criterion but still I’ve only convinced two people to vote yes. Why are so many people determinded to vote No?! Looking forward to getting this option here in NZ one day. Thanks Craig, it’s corrected now. There’s a referendum in NZ this year isn’t there – is AV one of the options being offered? Yeah it’s built into the next national, unfortunately the vote includes two variations of preferential voting and thus suffers from the FPTP flaw. if I ask you to buy me a Mars but a Mars is not available and I suggest you buy a Twix instead, I will not receive two bars of chocolate. A transferred vote is not a multiple vote. But votes are not Mars Bars. Your first vote takes a major Party below 50% so has an effect . Your second vote then decides who can win so it also has an effect. You get more votes . A preference is not the same as casting a vote. Also, if you read the blog, you’ll see that I say that coalitions are more likely to happen under FPTP anyway. AV does not automatically lead to more coalitions – what we have at the moment is a system where coalitions are getting more likely but there’s no way of accommodating coalition politics in the system we have currently. As I say time and again in the blog post, voters are moving away from the two main parties and AV is a reflection of that change. Who cares whether the system is “fair” to one party or another? What matters is: is it fair to us, the voters? – MPs can get in with less than a third of the vote: in Norwich South, where I live, for every three people who voted for the new MP seven would have preferred someone else. – people who want to support a party which cannot win in their constituency can have no influence over the result – their vote is wasted. AV give far more of us a say in who represents us, requires MPs to gather the support of a real majority to gain election, and ensures that widely unpopular candidates cannot win and that no-one’s vote need go to waste. Ok then you get more preferences then,you have more power if your preference is counted twice.End of . In every area you associate the Lib Dems with , including Constitutional reform there is already a class based bias in their favour as is very obvious from any Poll on any of those subjects. Who is left out ? Those at the edge and especially the educationally impoverished who do not vote at all and to whom the Labour Party under FPP look. Under AV the Labour Party will focus on second choices as if we need the all white middle -class faddy constituency even more over mighty and pampered. 80% didn’t support Conservative and Labour. Neither did 11% support the Lib Dems. 36% of people voted Conservatives which gave them 47% of the seats. 29% voted Labour which gave them 38% of the seats. 23% voted Liberal Democrats which gave them 8% of the seats. Their preferences are not counted twice. If their first preference doesn’t get in then it is ignored, erased, deleted, it is and ex-preference. Who do you think should be in charge? I’d say B because 33% are happy, 32% are ok with it and only 35% are not happy. If you choose A you’ve upset 65% of voters. Nice work champ. Of course some of the C voters could have had A as their second choice so when C gets removed maybe A would win after all. The point is that anyone must appeal a little bit to at least 50% of voters to get in. If it were the case that under AV some people’s votes were counted more times than others’, or that some people’s votes counted double, this would be a fatal flaw. Vote transfers are also a feature of the Single Transferable Vote (the clue is in the name). Successive Conservative governments introduced STV for local, Euro and Assembly elections in Northern Ireland, while a Labour government in Edinburgh introduced it for local elections in Scotland. (AV is used in by-elections.) If the defect is so glaring, how come the Tory and Labour governments concerned didn’t notice? Vote transfers also characterise the system known as the Supplementary Vote, introduce by the Labour government for mayoral elections. Again, if vote transfers weren’t a problem then, why have they suddenly become one now? Mr Cameron has a first-class degree, from Oxford, in Politics, Philosophy and Economics, and he knows all this perfectly well. He is guilty of one terminological inexactitude after another. Even if the Lib Dems weren’t there are all, major parties would still be looking for votes from the “liberally inclined”. The possibility of attracting second preferences under AV (rather than tactical or grudging support under FPTP) doesn’t alter this fact. The great benefit anyway lies in attracting the maximum possible number of first choices. Perhaps the least snappy dismissal is E is for Extra Votes. The problem is that the No slogan is superficially correct – AV does kind of give voters more votes (one each in every round of the knock-out process), and it does let people who are prepared to rank more candidates kind of say more with their votes. It’s the implication that this is unfair that is false, and that’s much harder to nail down and debunk. Under fuh-puh-tuh-puh everyone gets one vote, but some votes are more equal than others: votes for minor parties are wasted. By making it hard for minor parties, FPTP pushes us towards fewer parties that munge more different things together in their manifestoes, and as FPTP encourages opaque tactical voting you end up not knowing what the people really wanted or what the government really has a mandate for. If anything really leaves power in the hands of the politicians, it’s FPTP. 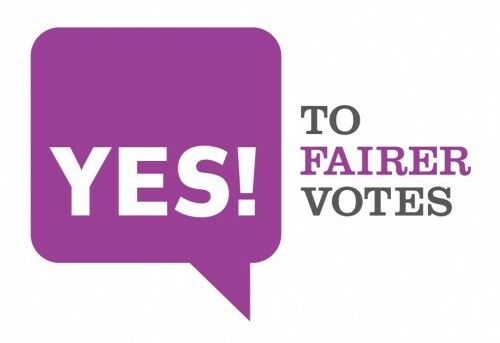 You could summarise that as: AV – more votes, equally for everyone, and they’re clearer & fairer! But to ‘get’ that you have to understand AV, so it may be snappier just to hit back name-calling fuh-puh-tuh-puh unequal and opaque. Well duh, because more than half the people in those constituencies vote for the same person… That’s kind of the point. We don’t want to change those seats, because they’re fair, it’s the ones where someone is voted in by less than half of the voters. Just wanted to say well done, this obviously took you a lot of work and research. I will definitely be using this in some of the arguments I have been having with people! My most serious objection to AV is that it shifts power to ‘certain to’ voters and especially minor Parties or centrist Parties and away from ‘might voters’ at either edge . In other words it narrows engagement to the already politicised . Amongst the politicised voter it shifts the onus on politicians to gain active support to avoid being actively disliked . You may like that I do not.I value choice,dialectic debate and inclusiveness over a over a inward looking centrist gloop. It is easy to see why AV might work when the purpose was establishing the best consensus in what is already an “Agreeing ” constituency such as a club or Political Party. STV or a PR system might be needed in highly tribal areas so as to ensure a say for negotiations. A British General election is no such thing; it is about deciding between fundamentally opposed political views and interests .Second choices are very much weaker than first. It also is about developing a constituency in a dialogue over time in which we are active supporters not just on-the-day focus groups asked questions we have given no thought to like spoon fed infants . You cannot make that claim and expect to have any traction with anyone who knows anything about it. Now on door step issues you say”Poverty in Africa ,….” blah blah blah but there is no support whatsoever for ballooning International AID budget and if you do not care about democratic mandates then what are we talking about? This is fundamentally undemocratic . 1. I have nowhere suggested that the same electoral system is suitable for all types of election. 2. I may be a liberal, but I’m not a Liberal Democrat. 3. If there’s as much *fundamentally* wrong with AV as the NO camp says, then it is not suitable for use in ANY elections, anywhere. So why oh why oh why is it used by MPs to elect committee chairs and by peers to elect the Lords speaker? Why did successive Conservative governments introduce STV and AV in Northern Irish local, Euro and Assembly elections and why did a Scottish Labour government introduce STV and AV for local elections? 4. AV would not help a woolly-minded centre party which was everyone’s second choice if it was no-one’s first. (a) In the ’50s lots of people voted and almost all of them voted for one or other of the Big Two, where nowadays far fewer people think it worthwhile to vote at all and far fewer of us are prepared to vote for either of the Big Two – does the indicate general satisfaction with our two-party-only system? The public’s view of parties and politics has changed and the electoral system needs to be reformed to reflect that change. (b) Since the war, have we really been better served by our rigid Either/Or system than e.g. Germany by two-party coalitions and the Netherlands by generally multi-party coalitions? (a) The great majority of us are represented by MPs we did NOT vote for, MPs chosen for us by other people. (b)	MPs can slide in with under a third of the vote. For every three people that voted for Norwich South’s MP, seven would have preferred someone else. (c) In a three-way contest it is perfectly possible for the least popular candidate to win, just because the opposing vote is split. (c) People who want to support a party which cannot win in their constituency have no influence over the result: their vote is wasted. (d) There is no post! FPTP gives the power to choose not to us, the people, but to politicians. It is not democratic. 1 – Oh for fcs your point three is precisely claiming that because AV is fine for some elections it is ok for a British general Election . I have already suggested why that leap of logic is absurd . How many times have I read that Cameron was elected by AV so its ok for a GE. That does not follow and I am glad you at least seem to understand that. Can we now forget this ridiculous and irrelevant supposed “point “? 4 – Not necessarily Warren Harding was elected by AV as the Republican Nomination after 9 iterations as a “Nobody actually hates him” candidate . he is commonly regarded as one of the worst and certainly most anonymous Presidents ever . No coincidence . You seem to have fundamentally misunderstood what AV is . It is common and simple for a candidate to come third and win as weaker and weaker preferences are counted . The French system avoids this and I think it infinitely superior for this reason alone . 6 After the war many Nations of the Continent lacking our democratic history and having already suffered failed constitutions were terrified of Populism ,think what it had delivered . For this reason they invented systems that kept the voter at arms length conferring power on Politicians and elites . AV would indeed make us more like the Continent and I am aware that Liberals think that anything European and elitist should be inflicted on the British by any means possible . The British prefer directly accountable administrations and rightly fear a system where a losing PM can do a deal with the PMs as Brown might easily have done . I am careful NOT to say that a system which is fine for one country or purpose is ipso facto fine for another. This is clearly not the case. What I AM saying is that if AV is as FUNDAMENTALLY defective as the NO camp keeps claiming then they should not tolerate its use in public elections for ANY purpose. However badly the LDs might do in another election this does not take us back to the kind of either/or party system we had e.g. in the ’50s. Both Ukip and the Greens now enjoy significant support. And what about Wales and Scotland, where as many as six parties may have significant support ? And, yet again: AV does NOT guarantee seats for smaller parties – it merely ensures that their supporters can tell the truth when they vote and still have a say in who represents them. There is absolutely no certainty that it would produce any more “hung” parliaments than “first past the post”. A system why regularly allows the election of MPs who are widely disliked and would lose in a straight fight with the runner-up or even with two of their opponents is so FUNDAMENTALLY defective that no amount of vague chatter about “accountability” or the British way can alter that fact. Finally, our prime minister has told, or at least tolerated the telling, of lie after lie about the nature, cost and complexity of AV. The prospect of a crew of liars winning the referendum is quite appalling. Exactly! The Tory’s plans for elected police commissioners have them being elected by Supplementary Vote (which is basically AV) not FPTP. jonathan is bang on the money here. Also Paul, if you want to trust bank holiday polling go ahead. It’ll be waaay closer than 66/34 or whatever it was. In your Y section, “disgusting .. misleading ad”, did you know political advertising is exempt from the Advertising Standards Authority (ASA) code. So no watchdog. Yes Annie that’s right. There appears to be no way of taking action against the ad because it’s exempt from both the ASA and the Electoral Commission. Which is annoying, but just means we have to work a bit harder to combat the rubbish arguments from the No campaign. If that were the case I cannot see the non mandate being accepted and there is a mechanism to challenge it. As for ” Would lose a straight fight with a runner up” I think you mean if the mythical progressive majority were one Party.Go for it. No-one is stopping you,have a coalition with Labour,make it permanent .Its all allowed ,if on the other hand people think that retaining separateness has a value higher than “beating the Tories” then FPP has delivered the right result. Paul…the only reason the Greens such a low percentage of the vote is because people don’t vote Green under FPTP. The Greens got 1.3m votes in the Euro elections and only 300K votes one year later. It seems most likely they felt the need to vote tactically because voting Green would be a waste. And why wouldn’t have Caroline Lucas not won under AV? You don’t know that necessarily. It is pretty unlikely she could win without a four way split,she is next door to me but no it cannot be proved. I have looked into what happened to the Greens in Oz quite closely. They were excluded by an interesting process. The ALP ,have twice been in trouble and on both occasions have adopted Green Policies targeting second preferences. There is no mystery about that we saw it in the London Mayorals to some extent ( a system designed to exclude the Conservative Party). That has had the effect of taking second choices but also first choices. I am not unaware of the Proportional problem .I think the best way to handle that is a semi PR HOL with some increased powers. Great post. Nice to hear some solid arguments backed up by facts for a change. VOTE NO TO AV !!! I have found a video that might describe better how the AV system brings about undesirable results. Everyone on both sides of the spectrum should watch this comedy sketch. Ive linked to your, A-Z of rubbish arguments from No-to-Av, site from my new web page title: The duncing of a nation. How misrepresentation won the AV referendum. Hopefully, people will recognise the need for standards of honesty in debate to be upheld in future.